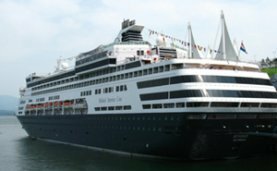 Find the Best Hotels Near Vancouver Cruise ship Terminal, with information to help you plan your adventure. Cruise Ship getting ready to leave the Terminal in Vancouver! There are many hotels near the Cruise ship terminal that are within walking distance. This can make your vacation plans easier and help you get ready for your exciting Cruise ship adventure. Here is some information that will help you make your choice about where to stay. The Fairmont Pacific Rim Hotel located at 1038 Canada Place, is one of the closes hotels to the Cruise ship terminal. Luxury is everything and everywhere at this hotel, be careful if you're going on a cruise, if you stay here you might not leave for you're cruise. 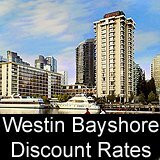 With its breath taking view of the water to the exceptional service the Fairmont Pacific Rim Hotel is a step above all hotels near Vancouver Cruise ship terminal. Looking for a great Pre-Cruise hotel the Ramada Limited Downtown Vancouver is the choice of many. Friendly, helpful staff and the conveniences of walking right from your hotel to the Cruise ship terminal can make this an ideal choice for visitors. Right across the street from the Pan Pacific is the Fairmont Waterfront, this hotel is in walking distance of the Vancouver Cruise ship terminal making it a great choice for visitors. Guest rooms feature stunning views of the mountains and the city. This hotel has a fitness facility, is near Stanley Park and conveniently located close to fine dining restaurants, retail shops, services and fast food outlets. The Coast Coal Harbour Hotel with its view of Coal Harbour and the mountains, is within walking distance of the Cruise ship terminal. This hotel features a fitness centre, swimming pool, exceptional view, friendly and helpful staff. Two blocks from the Cruise ship terminal this hotel will take care of your travel needs. Take advantage of its FREE shuttle service to the Vancouver Convention Centre and Canada Place. The Days Inn Downtown with its Cruise ship packages, helpful staff make this a convenient place to stay. 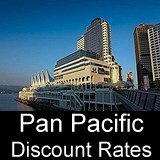 The Pan Pacific is located at Canada Place, is a luxury five diamond hotel that shares the complex of the Vancouver World Trade Center, the Vancouver Convention and Exhibition Center. The view of the Mountains, convenient location and helpful staff makes this the number one choice for travelers looking for a hotel. Be careful: Many of the cheapest places to stay near Vancouver Cruise ship terminal are located in the undesirable areas of the city. In a nice part of the city is Ashby House B&B, which is close to Robson Street shopping and restaurants it is about 10 blocks from the Cruise ship terminal. Tell us about favorite hotel near the Cruise Ship Terminal. Do you have a favorite hotel near the Cruise Ship Terminal? Share it! Our Readers favorite hotels near the Cruise Ship Terminal.